These photos show where you would want SkinnyBraces. How can we save you money and help protect your building? These fire sprinkler lines block the installation of any new structural elements next to the garage door. Shutting down the fire sprinkler system would require vacating the building. 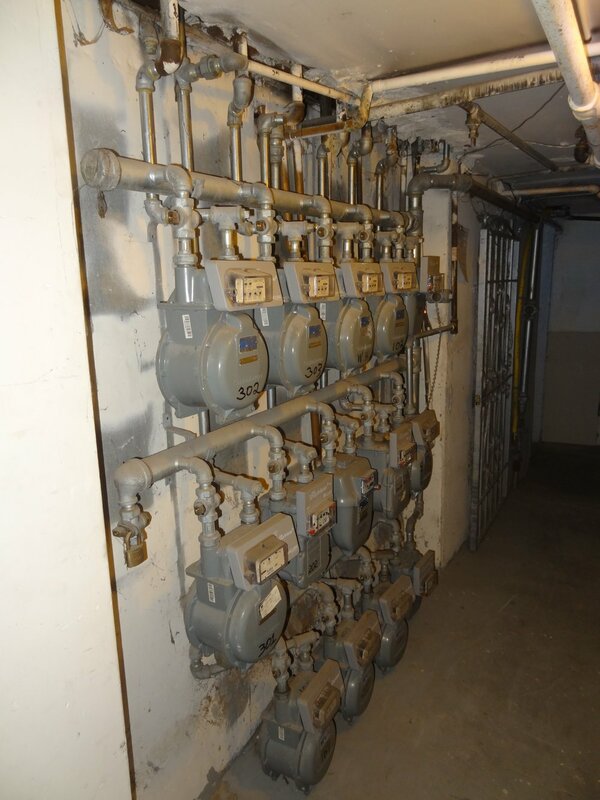 Relocating this bank of gas meters would cost thousands. SkinnyBraces help you avoid such obstacles. Just buy a skinnier car! The foundation to the right of this garage door is built along the property line. A single SkinnyBrace could go on the far side of the door—but for a steel frame, the door would have to be made narrower to allow installing one of the frame’s legs. Didn't you always want a motorcycle? Installing a steel frame around this garage door opening would not leave much room for a car. The gas meter in this garage is neatly hidden in the box behind the garage door track. Installing a steel frame would require relocating the gas meter (or making the garage door narrower). Another case where the legs of a steel frame will not be welcome. The left side of this garage door opening is about 8 inches from the property line. A SkinnyBrace would fit on the right side of the opening, problem solved! Those are some skinny walls! Yet another case where a steel frame just will not fit around a garage door. Two units, double the plumbing fun! Water services leave no room for steel frame leg.